• Provides a solution for small rooms, particularly kitchens, where limited floor space is available for a table, thus enabling maximum floor space to be maintained. • Convenient wall mount design-allows comfortable seating on both sides and unobstructed floor space. • Suitable for use as dining table, desk, in the kitchen or anywhere extra workspace is required. • Can be mounted on the wall at height to suit. E.g. bar table height, or dining table height. • Table can be mounted at low height suitable for small children. • Folds flat against the wall when not in use. • Folds out quickly and easily when needed. • Requires wall fixing. Before installation, ensure supporting wall is of appropriate construction and fixings included are suitable for your wall type. 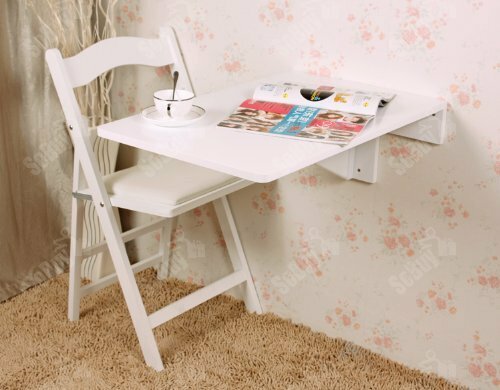 A mini version of the multi-use wall mounted drop-leaf table.